Doctor Who Ravenous 4 – A Medley of Masters! The finale of the latest series of Eighth Doctor adventures is fast approaching, and with it comes the ultimate battle! The Eighth Doctor (Paul McGann) and his companions face off against several iterations of the Master this October. 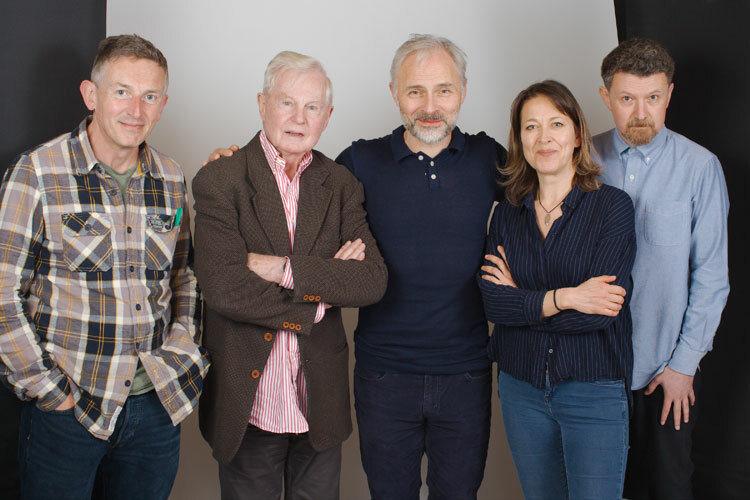 Michelle Gomez, Derek Jacobi, Geoffrey Beevers and Eric Roberts all return to the role of the Master/Missy for the finale of the collected Eighth Doctor range, Ravenous, being released in October 2019. 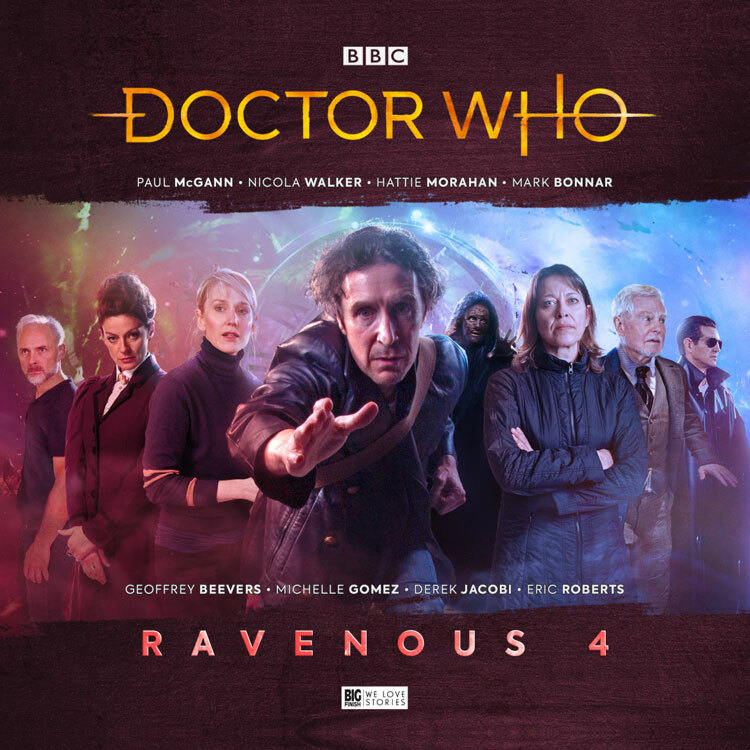 Ravenous 4 from Big Finish Productions sees an all-star lineup in a spectacular fight for the cosmos. Paul McGann and Eric Roberts will be facing off against each other for the first time since the Doctor Who television movie was released in 1996 – 23 years ago. Listeners have long wondered if the two would ever co-star in a Doctor Who story again… and now they only have to wait until October! And Nicola Walker and Derek Jacobi are also being reunited for Ravenous 4 having appeared together as daughter and father in the popular BBC One costume drama, Last Tango in Halifax. The Eighth Doctor team – Paul McGann (the Doctor), Nicola Walker (Liv Chenka) and Hattie Morahan (Helen Sinclair) – is joined by Mark Bonnar playing the deranged murderous Time Lord, the Eleven, who retains the personalities of his previous regenerations. But against more than one Master, the Doctor will need all the help he can get! Writer of the truly Master-ful finale, John Dorney, tells us more: “Day of the Master was possibly the most exciting and yet terrifying brief I’ve ever had. Finishing off the Ravenous arc was a big enough responsibility on its own… but throw in wanting to give great material to Sir Derek Jacobi… and Michelle Gomez… and that’s before we even get to the heart-stoppingly fantastic prospect of bringing Eric Roberts’ Master back face to face with the Doctor again for the first time in over twenty years. Producer, David Richardson tells us more about approaching the end of this epic four-part series: “We’ve tried to do something a bit different with Ravenous. Coming out of Doom Coalition, we wanted to go a bit darker, a bit scarier – to mark the saga with a shift in tone. With all four box sets now recorded, I feel a sense of relief – it’s been such a huge logistical challenge! Ravenous 4 alone required six studio days in cities as far apart as Los Angeles, New York and London! But we did it. We told that whole, big story and we’ve brought back three Masters and Missy in a breathtaking finale. Previous releases, Doctor Who Ravenous 1 and 2 are both available at £35 on CD or £30 on download. Or why not save money and get all four volumes of Ravenous in a bundle (each available on their release), priced at £90 on CD or £80 on download. Are Big Finish needing to ‘play to the gallery’ at the moment? Some of their series are finishing/finished (Omega Factor, New Counter Measures, Survivors(?)) and a number of their ‘pilot’ seasons (Jenny, Lady Christina, New Earth) haven’t had a second season announced yet. Or is this just a co-incidence? Or maybe they just don’t need to do a series for everything. Take The Lives of Captain Jack, it was a good set looking at different parts of his life but there’s Torchwood as well, so it didn’t need to be a separate range, and there’s not much to do with stuff like Tales of New Earth beyond one box set, same with Christina, without the novelty wearing off. I could see another Jenny, but not for a while as she’s in the 20th box set. Actually Christian Brassington is writing Charlotte Pollard Series 3 and it’s been in the stage of being written for about a year now. I doubt they will tie in with this. The War Master series has been mainly concerned with setting up Utopia (showing how the Master got the chameleon arch and eventually escaped the war) and hasn’t really left any plot threads to be picked up on here. Missy’s set did seem to set up a potential future story (there was a light arc about her modifying her TARDIS), but I’d be surprised if that shows up, and if it did all you’d need to know is she built a ‘Master TARDIS’ at some point. As long as you’ve been following Ravenous you should be fine. john dorney, writer of this story has confirmed that the events of this story are not linked to the war master and missy sets. It is a requirement however to have listened to all of ravenous and possible go back to doom coalition too as the companions and “the eleven” are on going storylines, whilst it is a great event for all the masters, the storyline is very much about the ravenous so its not recommended to skip to the last part of the 8th doctors ongoing story. I haven’t gotten round to the eighth Doctor yet, mainly because I know he’s with Sheridan Smith at one point, and then that woman from Eastenders at another point, then there’s a time war series and the ravenous series etc. etc. and I’ve got no clue how to even approach his era. But I was just asking as I haven’t got through missy or Jacobi yet and I just wanted to make sure I didn’t then need to have to buy episodes from the eighth doctor for anything to make sense. I’m in a similar pickle with riversong as I know she pops up in several separate series’s. Ah sjf I hadn’t heard that he’d passed on it. It’s been ages since I heard anything about it. The lives of captain jack isn’t really torchwood though. None of it takes place when he works for them. So it wouldn’t fit being moved there. On the Podcast Briggs replied to an email saying somthing along the lines of ‘good idea we need more McQueen I’ll email (somebody) in a bit.’ So we can hope for 2020 I guess. How is missy and derek’s master in this? Surely the Doctor would have recognised them in Utopia and Dark Water? This is the Eighth Doctor we’re talking about. He loses his memory at the drop of a hat. I’ve not heard the audios with river, but I was wondering how he didn’t remember her either. It is also entirely possible that ravenous will end of a cliff hanger with all the masters leading into the next era of 8 and resolution in the next box set. Precisely my thoughts on this. It’s Big Finish deliberately trying to pull in Nu Who fans who have probably heard of BF, but never delved in to their vast back catalogue. If you think of Classic – and even Nu Who – only in The Five Doctors (1983) and The Doctor Falls (2017) did have we have a Master meet a (to them) past or future incarnation of the Doctor. It seems really ridiculous to cram in 4 Masters AND The Eleven into this boxset. It’s the 8th Doctor and pre-Time War, so surely all we need is The Eleven (a fantastic standalone villain) and maybe the return of the Eric Roberts Master?! To add in Jacobi’s War Master, plus Beevers’ decayed (4th Dr era!) Master and Missy is just stupid. I miss the era of a 5-10 years ago, when Big Finish went in their own direction and weren’t on a leash to Nu Who That’s why in 2012 they created Alexander McQueen’s Master in UNIT Dominion and then featured him in the Dark Eyes series/arc. So to finalise, if Big Finish want more than one Master in this new box set, then surely it should be the Eric Roberts version and his (presumably?!) next incarnation, Alexander McQueen? No past or future Masters/Missy are required. Is it just me or are big finish becoming increasingly reliant on past continuity? Endless rematches with old villains are what big finish said they wouldn’t do when they first started. They have always been reliant on nostalgia. Daleks every season- ITS NOT ALL ABOUT THEM!!! Day of the doctor – 13 doctors. Name of the doctor – capitalises on the impossible girl story with narrative contrivance to have doctors 1-8 cameo in the story. twice upon a time- literally an episode of nostalgia. Gridlock – return of the macra. multiple rematches with the weeping angels. 12 rematch with rassilon on gallifrey. SARAH JANE SMITH ADDRESSING DAVROS AND TALKING GENESIS OF THE DALEKS! 2 major references to the valeyard. I will take big fnisihs anyway over the show, TV hasn’t ben great for the last few years sadly, great doctors with subpar stories. 14 of Peter Peter Davison’s stories featured returning characters. 14 out of 20. But that’s fine isn’t it because it’s old who… colin Baker did 8 stories if you count trial as a single story 8 out of which 6 feature returning characters. 2 minor mentions of valeyard not major. I don’t have a problem with characters coming back, I like it. All I’m saying about big finish is they are using a lot at the moment.